Sean Walker has been accused of murder. 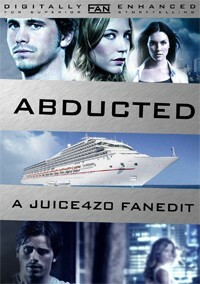 His girlfriend has been kidnapped while on a cruise to Antigua. Now with an unknown pursuer after him, he sets out in a desperate attempt to rescue her. Remove every bit of the Event from the Event and be left with nothing but a great kidnapping movie. Neglify for previewing the edit and doing the commentary. QuickCut for doing yet another of my box arts. Well I just finished watching this. What I remember about the tv series The Event was that it was so-so. It was sort of an interesting premise and the jumping back and forth through time was kinda cool. And that Sarah Roemer and Taylor Cole were hot. I rewatched the first 6 episodes of The Event to refresh my memory. I have to agree with g1orkatsos that this is definitely an interesting approach to an edit by taking a side-plot from a tv show and turning it into a movie length narrative. I watched the DVD of this edit. DVD design was nice. The trailer for this edit was really well made. The scene comparison was a cool special feature as well. edit and it wasn't too jarring. As was mentioned in another review, the outside shots of the cruise ship sure the quality difference is a bit noticeable, but the zoom had to be done and the quality difference is not horrible by any means (and in all honesty, had I not just rewatched episodes of the show, and not read the other reviews of this edit, I probably wouldn't have noticed at all). My only other complaint is being very nitpicky and stuff that can't really be fixed with fanediting. We never get an answer to who are these people and why did they kidnap Leila and why did they want Sean? In the end does it really matter though? We want Sean to rescue Leila and for them to live happily ever after. Other than that, I can't complain. I really enjoyed this edit. The video and audio quality were excellent. The inclusion of the flashbacks worked and helped to establish the connection and relationship between Sean and Leila. This edit definitely had the feeling of Taken (nice choice of end credits song btw!) with a little mix of Unknown and/or Flight Plan (no one believes me but im telling the truth). So overall this edit was action packed, fast paced and fun. I was a big fan of The Event and really disappointed when it got the axe. I was excited to see this fanedit and had high hopes for it. Overall, I think the edit works if you just kind of sit back, shut off your brain and enjoy the ride. It's a fast paced kidnapping story. Nothing wrong with that. A/V Quality: Audio is great with an excellent 5.1 DD track. Video was great with the exception of two exterior shots of the cruise ship that were much lower quality than the rest of it. Visual editing: Well done. One issue I had, and it's more of a pet peeve than anything, is in the opening credits: "NBC Studio's Present" makes no sense unless the fanedit itself is a present the belongs to the NBC Studio. Audio editing: For the most part well done, but not entirely unnoticeable. There were a couple of odd transitions in the first 15 minutes or so and the final fade out and transition to credits is a little too abrupt and awkward. Narrative: The biggest issue I had with this was the narrative. The viewer never finds out why any of this stuff is happening. Why is it so important to get Walker? As far as we know he's just some normal guy who's good with computers. Why were Sarah's parents murdered? Why was her little sister kidnapped? What happened to her anyway? The entire plot happens with no context, explanation or character motivation. There are three flashback scenes that offer no clues or serve any real narrative purpose. Enjoyment: It's a fun ride. Just don't think about it too much.